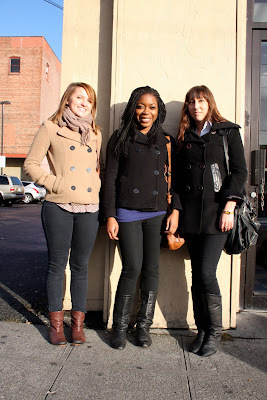 Sarah, Ogechi & Gindin- Between Pike and Pine on Broadway. Ironically I didn't even notice that these ladies were all wearing pea coats until I was reviewing the pictures on my computer later in the day. Their different styles and techniques for accessorizing give each coat its own feeling. Sometimes I will buy an item at J Crew or Anthropologie and worry that I am going to see it all over the place on other people. But then I realize that we don't usually notice others wearing the same items as us because everyone puts their outfit together differently. Each piece we buy is simply small part of the art that we create everyday when getting dressed. One of the many reasons that I love fashion and personal style.